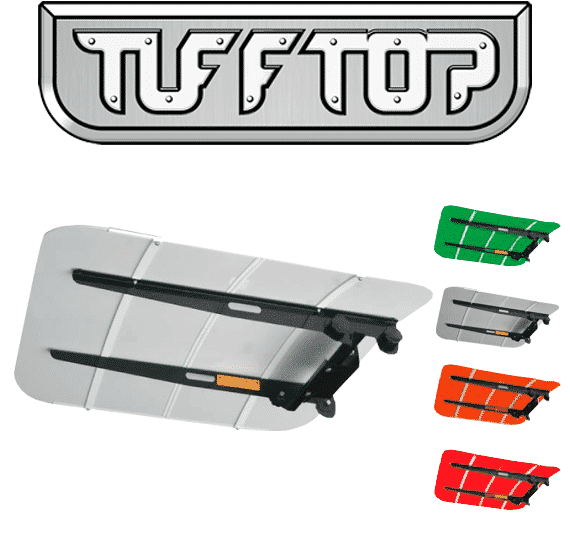 The Tuff Top canopy is made of a high density thermoplastic and fits 2” square or 2” x 3” ROPS. It has an adjustable fit for forward leaning, vertical or rear leaning ROPS. It installs, folds down for trailering at non-highway speeds(we suggest removal for speed in excess of 35mph), or removes in seconds without tools!!!! Strong steel frame is “e” coated and powder coated. Tough thermoplastic top panels and all parts easily replaced. Fits all ROPS equipped tractors with 2″ square or 2″ x 3″ ROPS. Adjustable to fit: forward leaning, vertical or rear leaning ROPS.